Graves Motorsports Yamaha R1 Full Titanium Exhaust System. Graves Motorsports Titanium Full Exhaust System is the exhaust system used on championship winning 2004 & 2006 AMA Yamaha R1 Superstock Bikes. This exhaust system features Titanium head pipes and collector tubing with your choice of Carbon Fiber or Titanium Silencers. Graves Silencers feature conical Titanium endcaps. Select from "Carbon" or "Titanium" silencers and "Standard" end caps or a "Polished" Showstopper end caps from the pull down menu when ordering. 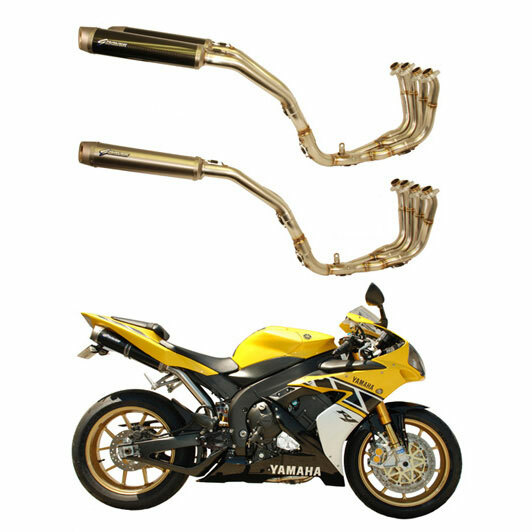 Yamaha R1 performance exhausts from Graves Motorsports.